Not everyone can cook. Some people can only handle the basics while others can't even boil water without burning it, but the chefs that made these utterly unappetizing meals are somehow a step below the people who can't boil water. This pile of green and red goop is supposed to be a pancake. That's right. A pancake. It's made out of spinach, which accounts for that stomach-churning green hue. Who knows what those streaks of red are, hopefully it's just ketchup. Ham is good. Pickles are good. Cream cheese? Definitely good. All three of those things combined in a poorly executed sushi-like roll? Utterly vomit worthy. This is one party snack that we'll gladly skip, thank you very much. Peas, hard boiled eggs, and shrimp, oh my! The only thing holding it all together is that force field of gelatin. Let's get one thing straight: gelatin is for desserts, period. Savory jello should have been left behind in the dark days of the '60s and '70s where it belongs. Who knows what's going on here. 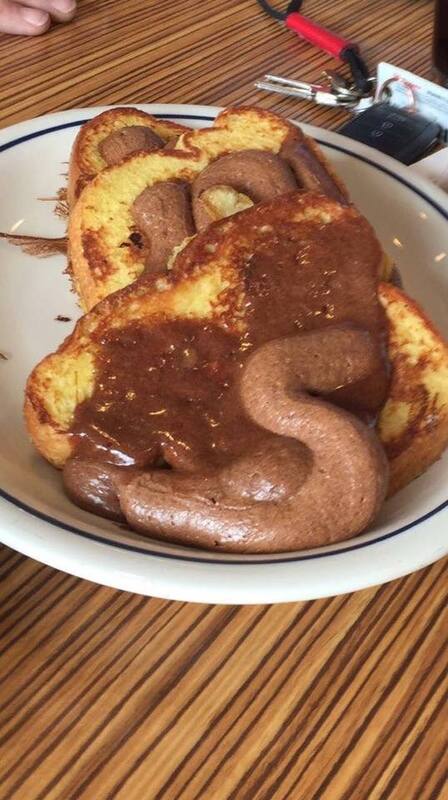 It sort of looks like someone took a dump on top of a plate of French toast, but that can't be right. Our only other guess is that it's some sort of sausage catastrophe. Whatever the case may be, you can't help but feel sorry for the poor sap that had to eat it and PAY for it at his local IHOP. Should have just cooked at home. Pineapple pizza is a sore subject for tons of people. Some people think it's great, others think it's the worst thing since the first splinter. Both sides can probably agree, though, that a pizza with pineapple, kiwi, mango, apple and pears is going too far. They might call it a pizza pie, but it's definitely supposed to be more savory than sweet. It looks like someone took a baby, put it in a bacon diaper, then baked it at 500 degrees for five days. That's not appetizing, it's horrifying! What kind of sick freak would want a meatloaf shaped like a baby? This meal is stomach churning for a couple of different reasons, starting with the fact that it was cooked in a latex glove in order to get that handy shape. Next on the list would probably be the extra sausage finger. Finally, there's the ketchup nail polish. Just...no. Did you know that it was possible to make jam out of Pringles potato chips? Well, now you do! What you do with that knowledge is up to you, but if you care for the culinary world even a little bit, you'll take that knowledge with you to the grave. Did someone order their chicken medium rare? 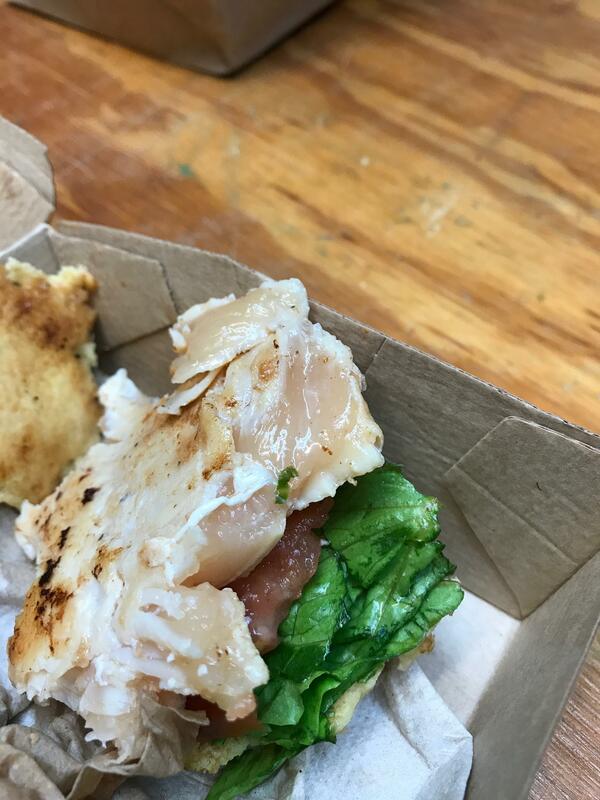 Probably the worst part of this photo are the bite marks, indicating that whoever was unlucky enough to get this sandwich got at least partly through it before they realized anything was amiss. Urk. 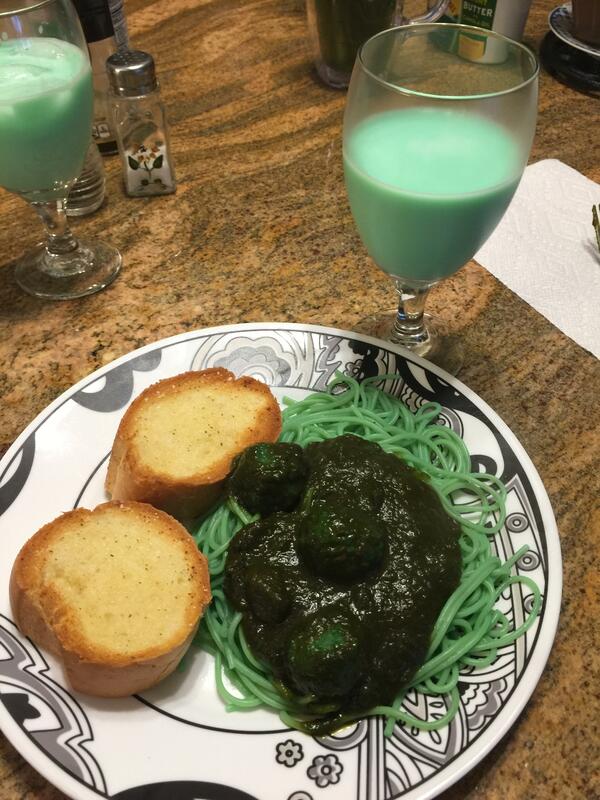 This dish was made in honor of St. Patrick's Day, but even Saint Patrick himself would think this was a little much. When will people learn that mushy food just don't look very appetizing when they're puke-green colored. Chicken calamari done...well, just done. It looks like some sort of nightmare monster come to life. Honestly, it just looks like a mama chicken and a daddy octopus loved each other very much and...you can guess the rest. Is this what Jessica Simpson meant when she was talking about the chicken of the sea?